It will be hard for the EU to admit that its postmodern dream of an eternally peaceful European security order is out of reach. But given Russia’s aggression, that is what it must learn to do – while bolstering its defenses. The cooperative relationship marking the end of the Cold War and the period that followed is clearly history. What is more, Putin continues to challenge the pillars of the European security order: the annexation of Crimea and Russia’s direct involvement in the fighting in eastern Ukraine violate the Helsinki Final Act (1975), the Paris Charter (1990), and the Budapest Memorandum (1994). In addition, Russia’s one-sided suspension of the Treaty on Conventional Armed Forces in Europe (1990) and its suspected breach of the Intermediate-Range Nuclear Forces Treaty (1987) reverse more than 25 years of arms control efforts. The Russian leadership’s use of force and multiple explicit threats – including nuclear threats – drastically transforms the nature of Russian relations with the EU and the US. The West might have at times mismanaged Moscow, but the deliberate decision to move away from the post-Cold War order is a Russian decision. It is accompanied by a growing reliance on nationalism and a geopolitical project entitled Eurasian Economic Union which unequivocally aims to reestablish uncontested Russian influence in its near abroad and restore Russia as a major power. This new Russia should, however, not be confused with the Soviet Union. It is economically fragile and further weakened by the decline in oil prices, as well as by limited Western economic sanctions which have discouraged investors. In spite of a rapidly growing defense budget (an increase of 152 percent since 2001) and an ambitious military and nuclear modernization, the Russian Federation is not in a position to be a genuine military threat to NATO and Europe, at least in the realm of conventional weapons. Lastly, the future of domestic politics remains unpredictable, as the popularity of the Russian president may or may not last. The most difficult challenge for Europe – and the West in general – is to manage two major asymmetries. First, Russia has the upper hand in the short term, while in the longer term the sustainability of Putin’s policy is questionable. Second, there is an asymmetry as far as political will on both sides is concerned. Putin has already sent weapons and troops to Ukraine and lost soldiers, whereas Europeans and Americans have often appeared divided and reluctant to fully acknowledge the gravity of events. Against the backdrop of these two imbalances, Putin retained the initiative, whereas the West has often seemed only to react. First and foremost, the West needs to recognize the reality of a deeply transformed European security environment and relationship with Russia and should no longer expect to go back to “normal” as it did after the Russo-Georgian War of 2008. The current state of affairs is the “new normal.” A naive approach underestimating these changes to preserve our comfort would only be perceived as weakness and trigger further unwelcome action by Putin. Second, NATO’s defense and deterrence capabilities need to be restored in order to make any aggression – even in the form of hybrid warfare – against any NATO or EU member state unthinkable, as solidarity amongst allies would be guaranteed. The September 2014 NATO summit in Wales was a first opportunity to address the shortfalls of the alliance’s military posture and improve its ability to address a European contingency. These efforts should continue. The best way to preserve peace in Europe is to make a major war impracticable through robust defense and deterrence, including its nuclear component. The allies should be unimpressed by Russian efforts to bully some of them and ready to display unconditional solidarity should the need arise. Third, on Ukraine, a two-track policy should be pursued. The Minsk II agreement offers a fragile and narrow path toward peaceful settlement. Its full implementation, including the restoration of Ukrainian sovereignty over its entire territory and borders, is the real test of Russia’s attitude in this crisis. Events since the first Minsk agreement, however, only allow for moderate optimism. In addition, and perhaps even more importantly, it is urgent to strengthen Ukrainian democracy and foster better governance through democratic, economic, and military assistance in order to reduce its vulnerability to Russian pressures, either direct or by proxy. This will come at significant financial cost, but it does not compare with the much higher price of Ukrainian collapse. Fourth, Moscow stands as a difficult but important partner in the management of a number of international crises (Iranian nuclear negotiations, Syrian Civil War, etc.) and will continue as such for the foreseeable future. Russia also remains a significant economic partner for Europe. A policy combining realistic engagement and increasing repercussions for Putin’s unacceptable behavior currently seems the best way forward. However, this needs to be pursued with the mid- and long terms in view, as the effectiveness of sanctions will increase as time passes. Should the situation arise, the EU and the West should not hesitate to immediately sanction the breakdown of the Ukrainian peace process or further Russian actions in Ukraine or elsewhere. The real challenge for Europe and the West vis-à-vis Putin’s Russia is to preserve the firmness and consistency of its policy: deterring further aggression through a robust defense posture, staying firm on democratic and governance principles, supporting Ukraine, and refusing to enter into rhetorical escalation, all while disallowing violations of agreements and rules. 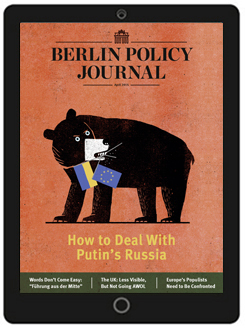 Read more articles from the April 2015 issue FOR FREE in the Berlin Policy Journal App. is Director of the Fondation pour la Recherche Stratégique in Paris.